An aneurysm is clipped through a craniotomy, which is a surgical procedure in which the brain and the blood vessels are accessed through an opening in the skull. After the aneurysm is identified, it is carefully dissected (separated) from the surrounding brain tissue. 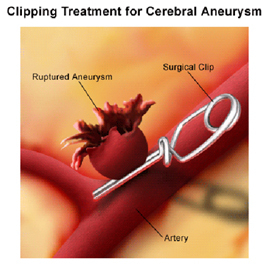 A small metal clip (usually made from titanium) is then applied to the neck (base) of the aneurysm. This decreases the pressure on the aneurysm and prevents it from rupturing. This surgery can be done depending on the location of the aneurysm, its size, and your general health. 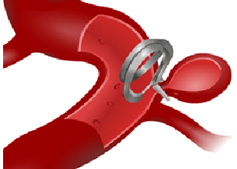 The clip has a spring mechanism which allows the two "jaws" of the clip to close around either side of the aneurysm, thus occluding (separating) the aneurysm from the parent (origin) blood vessel.